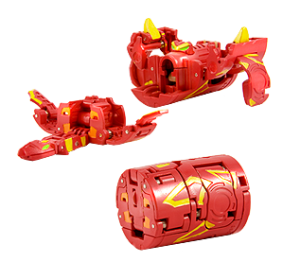 The Double Strike Bakugan hasn't had that much popularity as the Bakugan Battle Gears and Super Assault Bakugan. 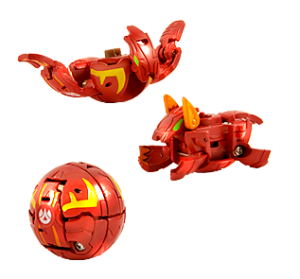 These are Bakugan that have a secondary attack that can either be automatically or manually triggered by the player. The extra attacks add more action on the field and add something more int he gameplay. In using the Sky and Gaia Bakugan into battle, roll it onto the Gate cards on the field and see if both halves of the opened Bakugan land on one or separate Gate cards. If both halves land on on the same Gate card, you decide which half will be moved to the other Gate card in play. If in moving it, there will be two battles, the player owning Sky and Gaia Dragonoid will pick which battle will start first. If they landed on the same Gate card and there are no other Gate card in play to move one of them to, then you decide which half to use for battle and which one to move into the used pile. If one lands on the Gate card and the other elsewhere on the field, the latter will go to the used pile and cannot be used again until the other half is used up and also goes to the used pile. In using the Dartaak Bakugan in battle, roll the Bakugan onto the field and see which Gate card it lands on and opens. If it lands on your Gate card, use only the G-Power of the main piece, the one that stays behind and not the projectile piece). If it lands on your opponent's Gate card, then add up both G-Powers of both the pieces of the Dartaak Bakugan and proceed with the battle.